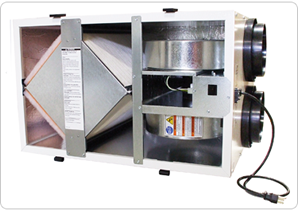 Energy Recovery Ventilators (ERV) are Air Exchangers that will cycle out air in your home with air from outside. The air crosses through a special heat exchanger that helps to retain some of the temperature and humidity that is currently in the house. ERV's are required in most commercial applications and depending on the home design can also be installed in newer homes. They are a great investment for breathing fresher air and allows your house to breathe without just pulling in unconditioned air. Learn more about it at this wikipedia article. 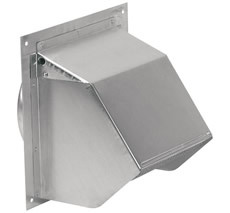 Fresh Air Intakes are common in new construction as they are required by code. Newer homes that are built so efficient that your home doesn't naturally breathe like older homes do. 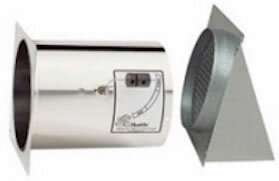 Fresh air intakes are installed to bring fresh air in when you operate bathroom fans or kitchen exhaust fans (and even Water Heater venting if you have a natural draft water heater installed), it also helps to control excess humidity in the winter that tighter or well insulated homes have. They have a weighted damper so they only open when there is a negative pressure.